BAGUIO CITY – The Commission on Elections (Comelec) recently announced the winning candidates for barangay and Sangguniang Kabataan (SK officials during the conduct of the May 14, 2018 barangay and SK elections. 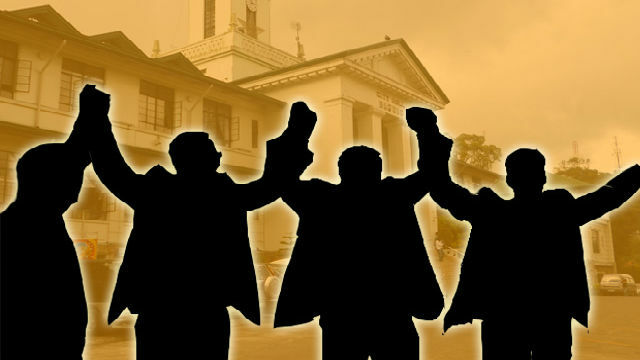 The proclaimed winning punong barangays are ABCR – George de Vera, AZCKO – Jefferson Cheng, Alfonso Tabora – Virginia Pugong, Ambiong – Randy Gati, Andres Bonifacio – Wilbert Ponce, Apugan-Loakan – Salvador Lumitap, Jr., Asin road – Jaime Candido, Atok Trail – Federico Codley, North Central Aurora Hill – Maria Teresa Valera, South Central Aurora Hill – Teresita Pacleb, Aurora Hill proper – Joselito Valentino, Bakakeng Central – Dan Daniel, Bakakeng Norte/Sur – Evelyn Balisong, Marcoville – Ruel Casuga, Balsigan – Dolores Mangusan, East Bayan Park – Roy Alexander Dawa, Jr., Bayan Park Village – Melvin Cortes, West Bayan Park – Margarita Marinas, BGH Compound – Ronald Garcia, Brookside – James Doligas, Brookspoint – Douglas Sial, Cabinet Hill-Teachers Camp – Edward Lumasang, Camdas Subdivision – Jeanette Floresca, Camp 7 – Angelina Ramos, Camp 8 – Lopito Nabulay, Camp Allen – Maribel Estacion, Campo Filipino – Joel Omar, City Camp Central – Jessie Salvador Bandiola, City Camp Proper – Jaime Bustarde, Country Club Village – Gil Lomboy, Cresencia Village – George Fangroy, Lower Dagsian – Michael Lawana, Upper Dagsian – Raymond Ruivivar, Dizon Subdivision – George Banayos, Dominican Hill-Mirador – Remedios Laigo, Dontogan – Henry Figueras, DPS Compound – Ariel del Monte, Engineers Hill – Amado Felizardo, Fairview, Justina Andaya, Ferdinand Marcos – Emmanuel Cabe, Fort del Pilar – Rolando Martos, Gabriela Silang – Orlando Basungit, General Emilio F. Aguinaldo – Michael Marinas, Lower Gen. Luna – Virgilo Manzo, Upper Gen. Luna – Tirso Baniqued, Gibraltar – Nemesio Huag, Greenwater Village – Magdalena Lambac, Guisad Central – Marion Bundad, Guisad Sorong – Mario Benalio, Happy Hallow – Joseph Sacley, Happy Homes-Old Lucban – Eva Marie Fianza, Harrison-Claudio Carantes – Avelino Limpin, Jr., Hillside – Jose Cawiding, Holy Ghost Extension – Richard Faguinney, Holy Ghsot Proper – Murphy Maspil, Honeymoon-Holy Ghost – Romulo Wayway, Imelda Marcos – Ernesto Laguardia, Imelda Village – Socoro Fernandez, Irisan – Arthur Carlos, Kabayanihan – Susan Gundran, Kagitingan – Franco Cordoviz, Kayang Extension – Nerissa Bayan, Kayang-Hilltop – Rene Biagtan, Kias – Timothy Pudlao, Jr., Legarda-Burnham-Kisad – Teodoro Castro, Loakan Liwanag- Casimiro Castillo, Jr., Loakan Proper – Eduard Emmanuel Cayetano, Lopez Jaena – Carlos Asiatico, Lower Lourdes Subdivision – Florante Sapitula, Lordes Subdivision Proper – Rowena Gelisanga, Lourdes Subdivision Extension – Jeffrey Timmango, Lualhati – Julius Ampal, Lucnab – Enrique Lindaoan, Lower Magsaysay – Efren Donaal, Upper Magsaysay – Prescilla Dacanay, Magsaysay Private Road – Debbie Banaggui, Malcom Square – Hadji-Imran Baniaga, Manuel Roxas – Elsie Magdalene Tindoc, Upper Market Subdivision – Ma. Teresa Caracas, Middle Quezon Hill – Editha Lina Ibarra, Military Cut-off Emily Gundran, East Modern Site – Peter Bucasan, West Modern Site – Federico Yumul, Mines view Park – Rolando Cayat, MRR-Queen of Peace – Raul Caronogan, New Lucban – John Caluza, Outlook Drive – Miguel Arnaiz, Pacdal – Abraham Lagasca II, Padre Burgos – Bonifacio Bustos, Padre Zamora – Ricardo Balinton, Palma-Urbano – Florida Gacayan, Phil-Am – Sarah Mina, Pinget – Pablo Pawe, Jr., Pinsao Pilot Project – Dexter Fag-ayan, Pinsao Proper – Joracio Willy, Poliwes – John Alban, Pucsusan – Ricardo Mendoza, Upper Quezon Hill – Dinah Campos, Quezon Hill Proper – Caesar Malicdan, East Qurino Hill – Joel Bangloy, Lower Quirino Hill – Van Oliver Dicang, Middle Quirino Hill – Ignacio Gallente, West Quirino Hill – Anselmo Tao-ing, Upper QM – Andres Rimorque, Jr., Rizal Monument – Agustin Sister, Jr., Lower Rock Quarry – Benigno Marzan, Middle Rock Quarry – Arnold Camungao, Upper Rock Quarry – Joey David, St. Joseph Village – John Dongla, Salud Mitra – Nida Galace, San Antonio Village – Nicanor Nialla, North Sanitary Camp – Virggio Orca, Jr., South Sanitary Camp – Manfred Bilibli, San Luis – George Saguid, Jr., San Roque Village – Errnesto Amon, Sta Escolastica Village – Thelma Pasag, Sto. Rosario Valley – Herminio Estipular, Sto. Tomas Proper – Josephine Balusdan, Sto. Tomas School Area – Godofredo Cawaing, San Vicente – Luis Dulagan, Scout Barrio – Manolo Llanita, Session road-Gov. Pack road – Onofre Ibanes, Slaughterhouse Compound – Camilo Tacbas, SLU-SVP Housing Project – Herardo Lamaton, South Drive – Maribel Cagalawan, Teodora Alonzo – Arnold Alimbuyao, Trancoville – William Regacho and Victoria Village – Arile Reyes. On the other hand, the winning SK chairpersons were ABCR – Kristine Masliyan, AZCKO – Eisah Yusoph, Alfonso Tabora – Melanie Camarao, Ambiong – Corriur Ap-apid, Andres Bonifacio – Danilo Abril, Apugan Loakan – Jaime Apola, Asin road – Precious Weygan, Atok Trail – Ramil Cayat, North Central Aurora Hill – Charlene Mina, South Central Aurora Hill – Levy Lloyd Orcales, Aurora Hill Proper – Abygail Ilas, Bakaeng Central – Genny Rose Punzal, Bakakeng Norte/Sur – Ngina Tambol, Marcoville – Ma. Fe Tersa Ejar, Balsigan – Jameber Quipot, East Bayan Park – Garth Erwin Soriano, Bayan Park Village – Harvey Espiritu, West Bayan Park – Forest Gayo Aliping, BGH Compound – Mike Angelo Garcia, Brookside – Billy Cris Rafael, Brookspoint – Van Paulo Sanchez, Cabinet Hill-Teachers Camp – Menard Valera, Camdas Subdivision – Rashlyn Siloy, Camp 7 – Kieffer Jan Binay-an, Camp 8 – Jonalyn Lonogan, Camp Allen – Charlene Joyce Lagman, City Camp Central – Aloisius Nyk Aldea, City Camp Proper – Daniel Miguel Seguin, Country Club Village – Clint Rojan Borja, Cresencia Village – Sheane Damagon, Lower Dagsian – Jervin Bendian, Upper Dagsian – Bhelmar Tami-ing, Dizon Subdivision – Laurence Salupen, Dominican-Mirador – Ivory Gambican, Dontogan – Alpha Bagowan,, DPS Compound – Jon Jervis Gonzales, Engineers Hill – Maryella Kryzelle Eslava, Fairview – Jezzel May David, Ferdinand Marcos – Reilloc Cabading, Fort del Pilar – Rezo Luis Segubience, Gabriela Silang – Jane Camte, GEFA – Russel Dave Aliping, Lower Gen. Luna – Sheela Mae de Jesus, Upper Gen. Luna – Joyce Rhen de Guzman, Gibraltar – Jeric Sinner, Greenwater Village – Rhealyn Baldos, Guisad Central – Kenneth Alakyang, Happy Hallow – Ivy Manganip, Happy Homes-Old Lucban – Marjorie Candido, Harrison-Claudio Carantes – Gerry Sao-an, Holy Ghost Extension – Alexandra Pais, Honeymoon-Holy Ghost – Kevin Somera, Imelda Marcos – Angelo dela Cruz, Imelda Village – Vanessa Tejada, Irisan – Carla Joy Cacho, Kabayanihan – Jeric Valenciano, Kagitingan – Efren Theodore Sucte, Kayang Extension – Allen Fernandez, Kayang Hilltop – Cherry Mae Urbano, Kias – Leani Aginnaya Pangket, Legarda-Burnham – Jenny Lyn Generalo, Loakan Liwanag – Jon Lorenzo Buhong, Loakan Proper – Haidee Grace Balangitan, Lopez Jaena – Tristan Troy Diaz, Lower Lourdes Subdivision – John Paul Fontanilla, Lourdes Subdivision Extension – Yasmin Macadangdang, Lualhati – Alec Anton Parrocha, Lucnab – Andreson Accatan, Lower Magsaysay – Aubrey Mae Andrada, Upper Magsaysay – Ryan Gamaliel Gallao III, Magsaysay Private road – Jesse Jay Lictao, Manuel Roxas – Luicaa Mae Dioso, Upper Market Subdivision – Carla Mae Villena- Middle Quezon Hill – Francine Faith Yabut, Military Cut-off – Estephanie Gundran, Mines view Park – Ismael Masla, East Modern Site – Shai Eldrik Roncal, West Modern Site – Eva Jane Valdrez, MRR-Queen of Peaace – Jefffrey Bulao, New Lucban – Michael Jhay Guieb, Outlook Drive – Irisha Gayle Esteban, Pacdal – Kim Grayle Salio, Padre Burgos – Eryj Jerl Dayote, Padre Zamora – Carol Mae Tomas – Palma-Urbano – Kathleen Keigh Absalon, Pinget – Soulykhaaa Ruth Chokyogen, Pinsao Pilot Project – Aysssa Dawn Alalag, Pinsao Proper – Shaira Frances Santiago, Poliwes – Junstine Garcia, Pucsusan – Philip Cezar Salvador, Upper Quezon Hill – Kathlen Ariaga, Quezson Hill Proper – Trisha Joy Quijano, East Quirino Hill – Jonamay Siano, Lower Quirino Hill – Jeverly balangue, Middle Quirino Hill – Eva Mae kate Balay-odao, West Quirino Hill – Jake Ticag, Upper QM – Maria Carissa Gordoviz, Lower Rock Quarry – John Chris Maggan, Middle Rock Quarry – Mizraim Cedee Aswigue, Upper Rock Quarry – Aileen Grace Buccat, Sto. Joseph Village – Rochelle Banga-an, Salud Mitra – Merlin Lance Alvis, San Antonio Village – Jonathan Baniqued,North Sanitary Camp – Faye Alexis Wanas, South Sanitary Camp – Jon Erick Victorio, San Luis Village – Rubino Sumerbang, San Roque Village – Pauli Von Maurice Postigo, Sto. Tomas Proper – Julie Grace Bandao, Sto. Tomas School Area – Venus Legaspi, San Vicente – Jobilee Siagan, Scout Barrio – Samantha Aubrey Lopez, Session road-Gov. Pack road – Julie Bernadine Kido, Slaughterhouse Compound – John Richard Tubon, SLU-SVPO Housing Project – John Eric Ocampo, South Drive – Nikko Fenandez, Teodora Alonzo – Yvonne Lagan, Trancoville – Aaron Joshua Cabrera and Victoria Village – Zyrah Nicole Leonen.